A comprehensive interview with postdoc Marina Vietri from Harald Stenmark's group at the Department of Molecular Biology has recently been published on ResearchItaly.it - the web portal of the Italian Ministry of Education, University and Research (MIUR) established in order to map, support and promote high-quality Italian research. 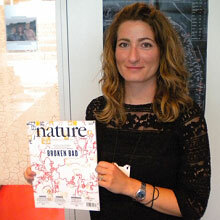 The introduction to the English version of this readable interview goes as follows: "From San Raffaele in Milan to the Institute for Cancer Research of the University Hospital of Oslo where her research deserved publication in Nature and she won the Norwegian H.M. the Kings Gold medal for best PhD thesis in Medicine in the year 2016, being the first Italian researcher who has ever received it." Home page of Harald Stenmark's group "Cellular membrane dynamics"